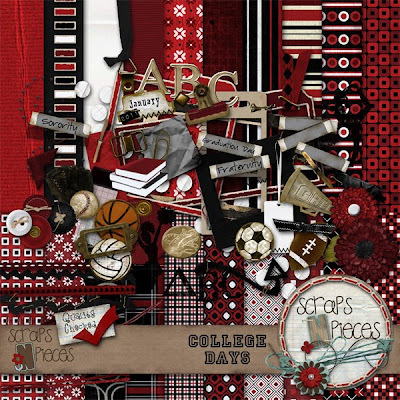 I am so incredibly excited to announce that I have been accepted as a Word Art designer at the new Scraps N' Pieces store. 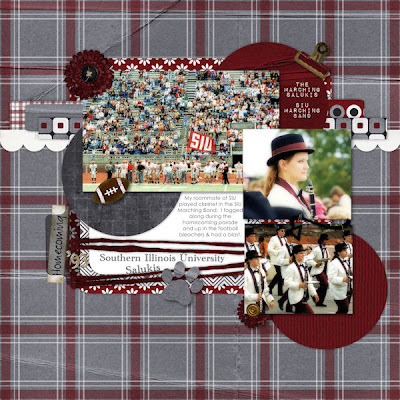 I started digi-scrappin' just 2 1/2 years ago, but quickly realized that designing would be a great creative outlet in addition to creating layouts. I love word art, and although I'm still learning new techniques and styles (and have a ways to go compared to others in the "biz"), I still love being able to bring you my work. I hope you love it. Next month...well, actually this month (9/30) is the Homecoming parade and football game here in town. The next day (10/1), our daughter will go to the homecoming dance as a sophomore in high school. Where did the time go? 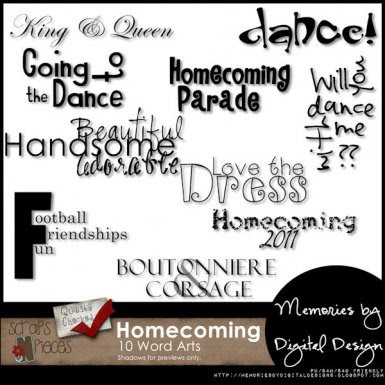 I knew I wanted to create some Homecoming word art in preparation for those pictures/layouts. The preview is below and is linked to my SNP store. Do you know what kit, well kits actually, would go great with this word art? 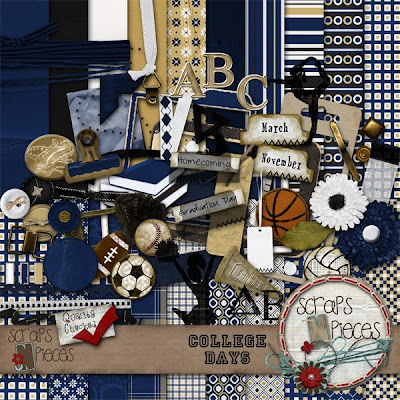 The lovely sisterly designers (Lori & Heidi) that make up Scraps N' Pieces, have designed a custom college kit (College Days)- just like their custom high school kit released a while back. 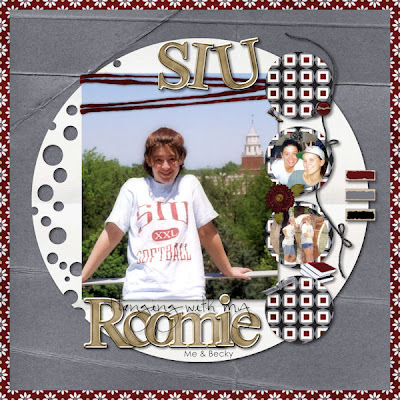 I proudly grew up in Southern Illinois and went to SIU. I had a few pics of me & my dorm roommate that I knew would look great with this kit. Here's how it works, you can purchase the kit at either Stuff to Scrap or their store Scraps N' Pieces. It's currently priced at $7.99 (originally $11.99). There will not be any download links. 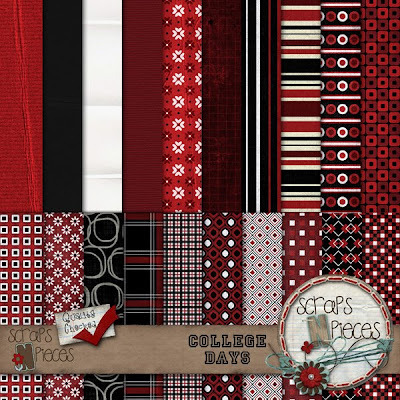 You send your invoice and 4 color choices to Lori. 1-2 weeks later, wah-lah...a custom kit. Detailed instructions are available here. 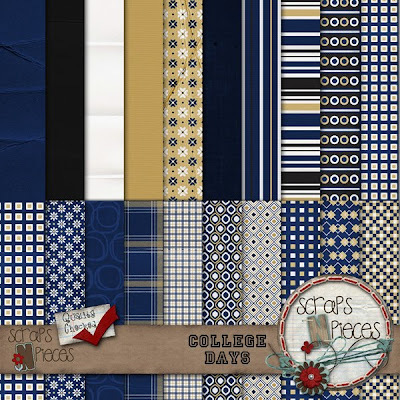 Here are the previews of some custom kits they've already created (a preview isn't available for the SIU kit). My SIU layouts are shown after the previews. Kit previews are linked to the SNP store, layouts linked to the SNP gallery. Here are the layouts I created of me & my college roommate. I had so much fun creating these. The first one I created in a recent speed scrap at STS. Do you want to get a taste of how awesome these custom kits are? 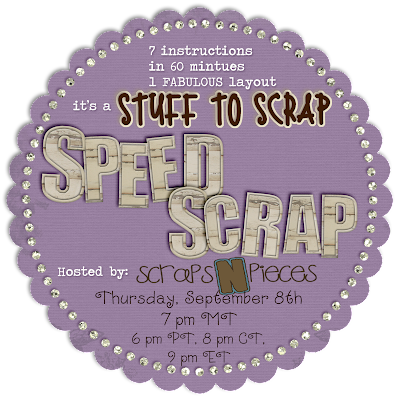 Join us on Thursday evening over in the Stuff to Scrap forum & chat room for a speed scrap. The participation prize is a mini-kit. I'm secretly super-excited for this prize for selfish reasons - my high school colors were black & white. I can finally start scrappin' some of my hs pics (once I find them & scan them in). Both images below are linked to STS forum. Oh and about the Scraps N' Pieces store - the Grand Opening isn't officially until October 1. BUT, the store/gallery/forum are all up & running. We are working hard putting the final touches on the forum. Challenges won't begin until October. We highly recommend you get all registered and set-up so you can hit the ground running come 10/1. Hope to see you around there soon!